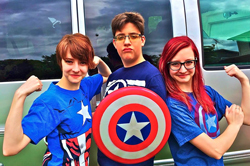 2015 Daytime Emmy nominees Ariel, Zoey & Eli (AZE) are quickly becoming the face of their geek/nerd generation. The three siblings (Ariel and Zoey are identical twins and Eli is the "little" brother) star in two national television shows (Ariel & Zoey & Eli, Too and Steal the Show). Following the release of their con anthem, Take Me To Comic Con, AZE developed an immense international following on Facebook where they share their mad musician skills and quirky senses of humor. For AZE, it does not get any better than performing at cons and meeting fellow cosplayers! AZE's Daytime Emmy nomination was for Outstanding Original Song, becoming the youngest ever to be nominated in this category.